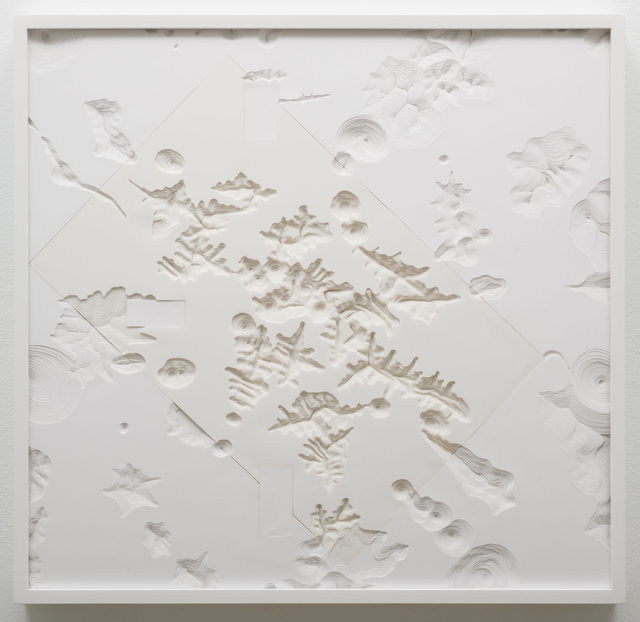 Noriko Ambe cuts into stacks of paper with a razor blade, one sheet at a time, to create sculptures that resemble three-dimensional topographical maps. "Parallel World" is about the relationship between art and nature, human ingenuity, and the perception of our physical world. 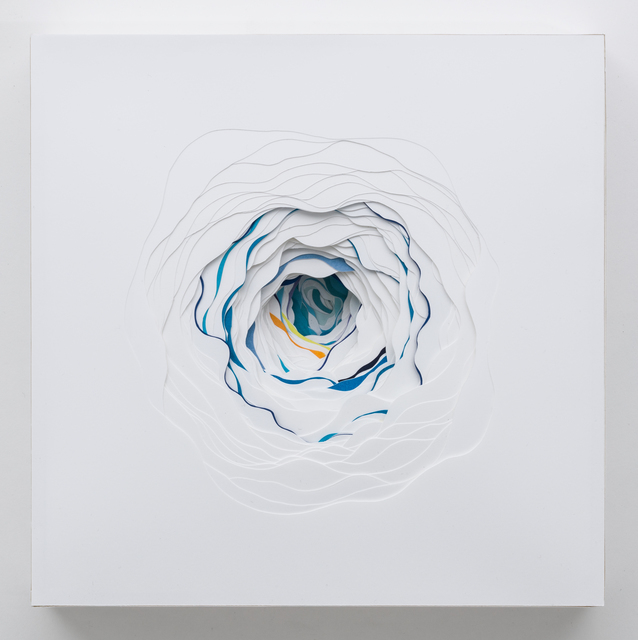 Lora Reynolds is pleased to announce Parallel World, a project room exhibition of new paper sculptures by Noriko Ambe—the artist’s fourth presentation at the gallery. 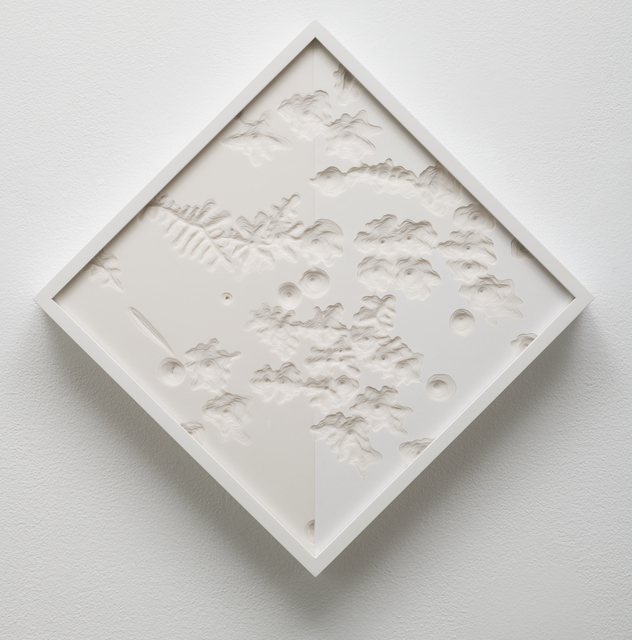 Noriko Ambe cuts into stacks of paper with a razor blade, one sheet at a time, to create sculptures that resemble three-dimensional topographical maps. 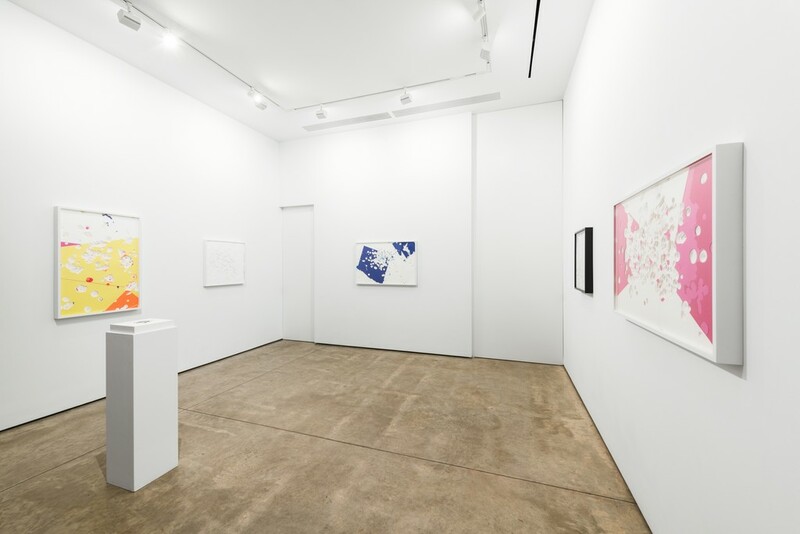 The works in this show are framed and hang on the wall; several are entirely white (the color she is best known for using), while others from a new series feature bold fields of color. 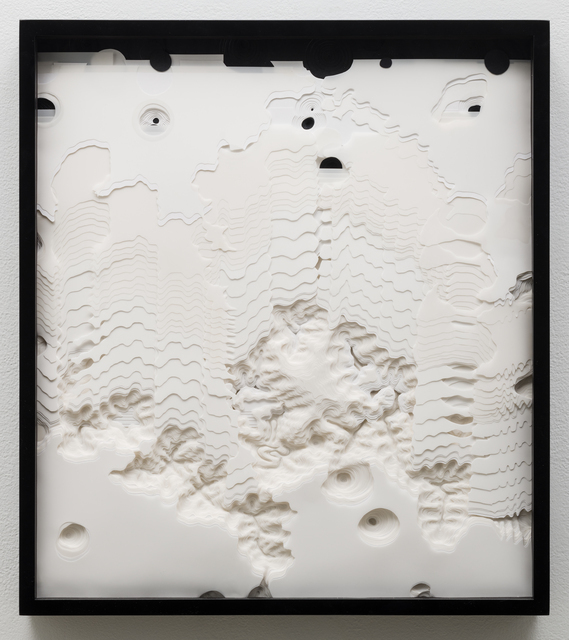 To begin each sculpture, Ambe makes a series of small incisions in its bottommost sheet of paper—the one that will be closest to the wall, furthest from the surface of the finished piece. Because she cuts this sheet with a full stack of paper underneath it, her knife scores its path on the second sheet of paper in the stack. When she moves on to the second sheet, she slices a slightly larger hole around the scored lines. After repeating this process on dozens—even hundreds—of pieces of paper, she ends up with dizzyingly complex artworks. The trip bolstered Ambe’s longstanding interest in nature and geology, but it also led her to a contradictory epiphany. 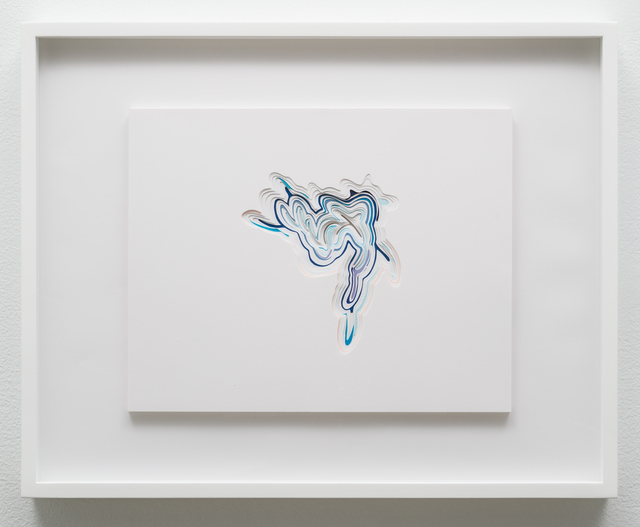 Although her work points to the physical world, it is not, itself, natural. Her sculptures are constructions, fabrications. And as much as they are about nature, they are also about artificiality and abstraction. With this realization, Ambe felt freed from her previously intense focus on nature. 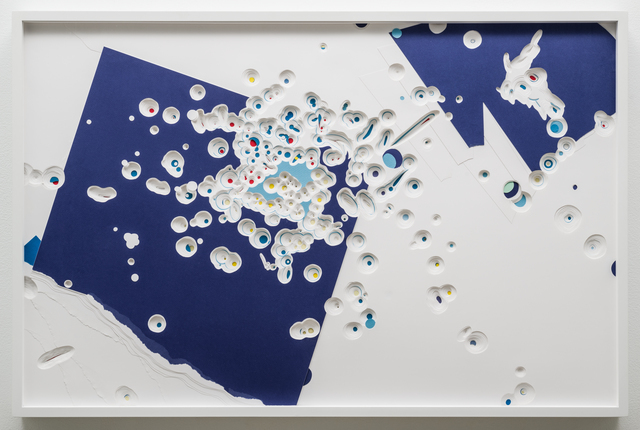 Although the physical landscape has remained an integral part of her work, her newest sculptures also mine art history—in particular, the first forays into abstraction by artists like Kazimir Malevich and Hilma af Klint. 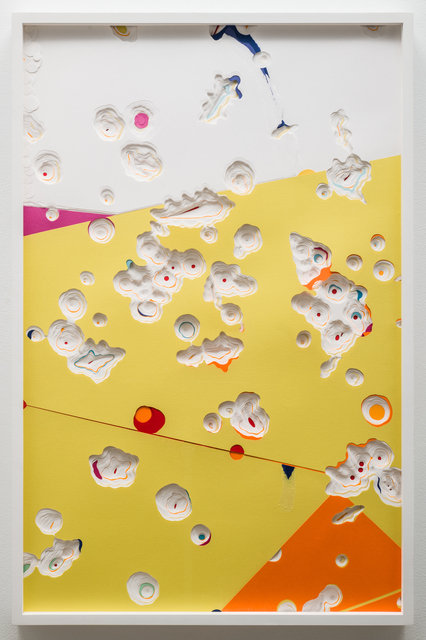 And in addition to paying homage to the greats of the past, she is also forging new ground: no longer do the organic forms she carves out of paper resemble straightforward geological formations—they seem like purer products of her imagination that have few referents in the real world. 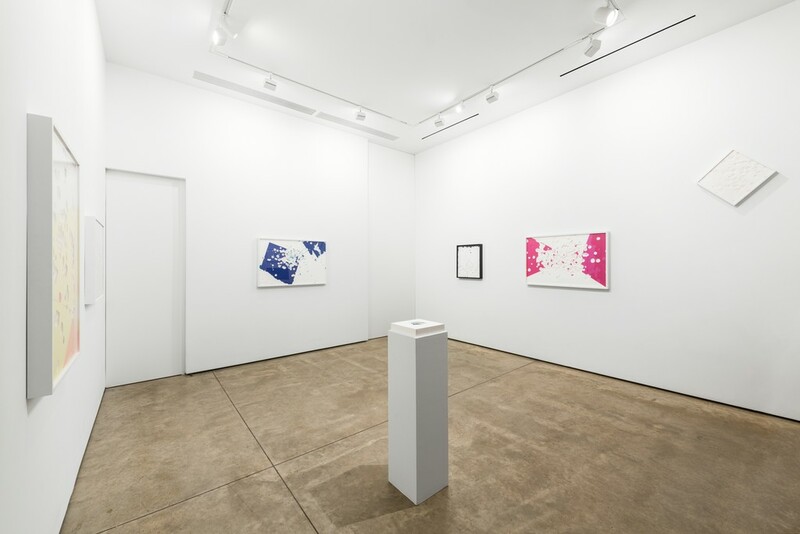 Some pieces in this show include large blocks of color, which are defined by straight lines (at odds with her more freeform carvings) and resemble beams of projected light. Relevant, perhaps, because Ambe sees a parallel between the colored paper in her new pieces and colored light, as if her usual white paper were projected through a prism and dispersed into its component colors. Parallel World is about the relationship between art and nature, human ingenuity, and the perception of our physical world. Balance, order, and purity—whether human constructs or naturally occurring phenomena, Ambe is continuing to hunt for them. Noriko Ambe was born in Saitama, Japan in 1967 and lives and works in New York and Japan. She has had solo exhibitions at the FLAG Art Foundation (New York) and Syracuse University Art Galleries (New York). 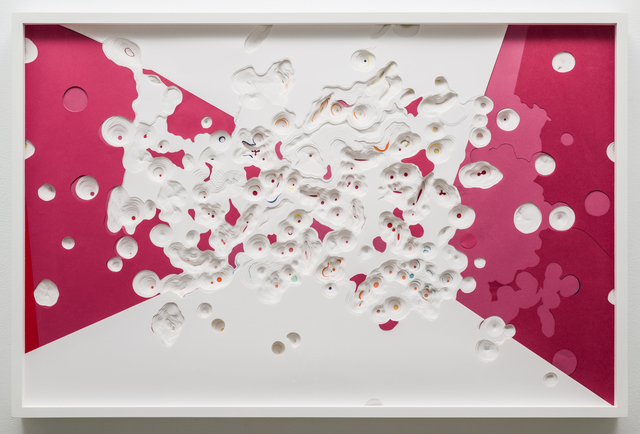 She has participated in exhibitions at the Albright-Knox Art Gallery (Buffalo), Berkeley Art Museum and Pacific Film Archive, Everhart Museum (Pennsylvania), Museum of Arts and Design (New York), Nasher Sculpture Center (Dallas), Scottsdale Museum of Contemporary Art, and Weatherspoon Art Museum (North Carolina). 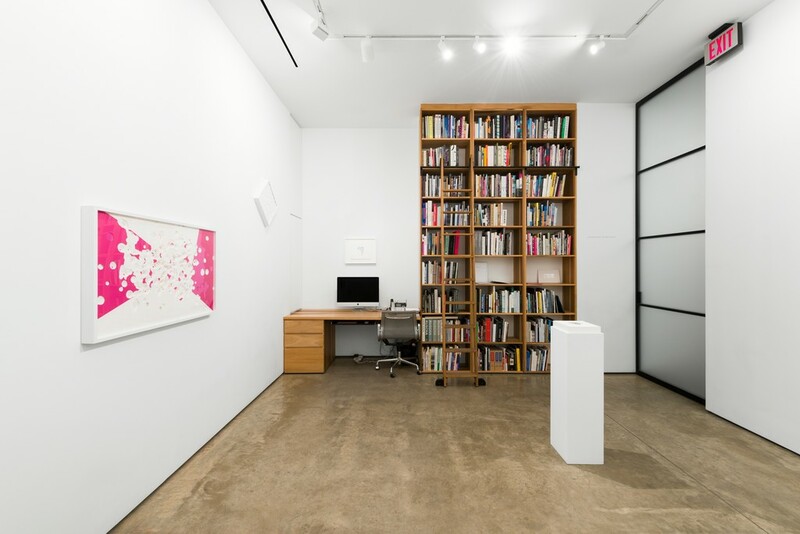 Among the museums that own her work are the Museum of Fine Arts, Houston, Museum of Modern Art (New York), Urawa Art Museum (Japan), Whitney Museum of American Art (New York), and Yale University Art Gallery (Connecticut).